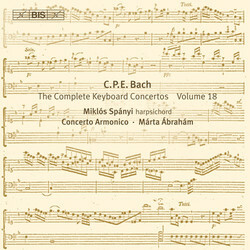 Three years have passed since the release of the previous volume in this series, but now Miklós Spányi continues his traversal of the keyboard concertos of Carl Philipp Emanuel Bach, a series which in Gramophone has been called a ‘unique monument to one of the 18th century's most underrated composers’. Once again Spányi has joined forces with the Hungarian period band Concerto Armonico, and together they offer us the first four works in a set of six, the Sei Concerti per il cembalo concertato. Composed during the early 1770s, the Sei Concerti were among the few concertos that C.P.E. Bach didn’t write specifically for himself to play. In order to secure a large number of subscribers for the scores, he advertised their publication repeatedly, marketing the works as ‘easy’. He also included parts for wind instruments (‘for reinforcement’, thus optional): two horns in all the fast movements, replaced by flutes in the slow movements. 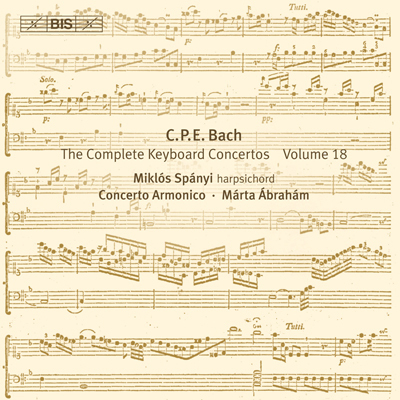 Bach’s aim was to make the works appealing to both players and listeners, and the result is a set of highly attractive pieces, with approachable melodies and dance rhythms but also displaying a new freedom with regard to conventional concerto form. Particularly striking is the fourth concerto, the four movements of which are run together seamlessly, while continuity is further reinforced by the reappearance of thematic material throughout the entire concerto. For these works, Miklós Spányi has chosen to perform the solo part on a harpsichord, a copy of an instrument from 1745 by the Antwerp builder Joannes Daniel Dulcken. Inspired by the English harpsichords that were imported in great number to Northern Germany during Bach’s time, Spányi has had his instrument fitted with a so-called ‘swell device’, enabling the performer to achieve dynamic shadings and crescendo-diminuendo effects consistent with the various instructions in Bach’s scores.